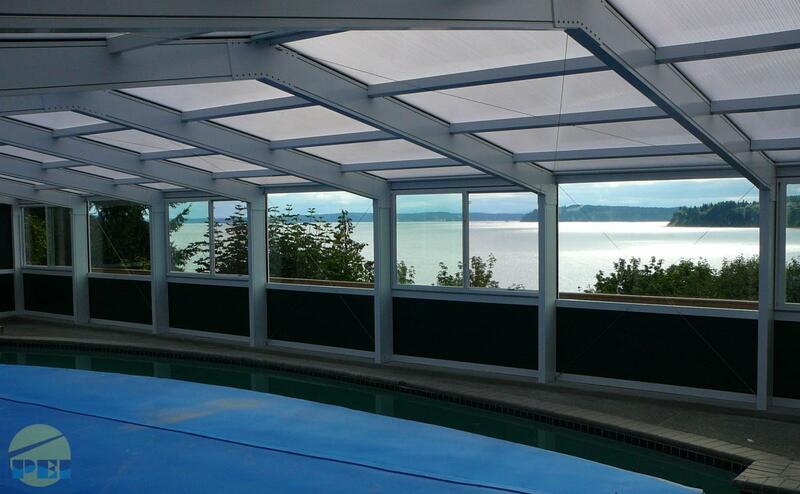 Below are photos of a 27'-0" span x 49'-8" gable shaped stand-alone pool enclosure located near Tacoma, WA., overlooking Puget Sound. 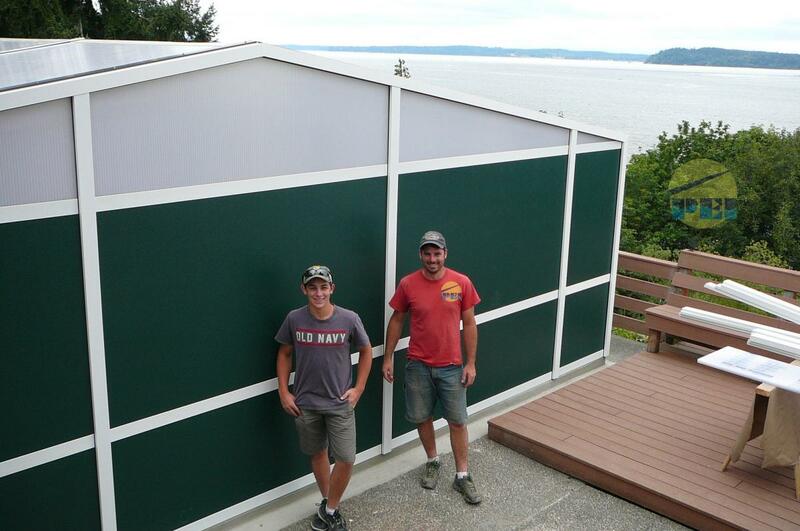 The owners opted for aluminum faced solid foam-core panels in a Hartford Green color to match their house color. A request from the owners was a low profile roof so the enclosure would not block the view of the Sound....The roof slope was 10 degrees. Other features include fixed 1" clear low-e tempered glass, sliding glass windows with screens and a sliding glass door. The roof is 25mm (1") ten-wall I.R. gold polycarbonate. The existing pool required a slightly raised continuous foundation grade beam all around. 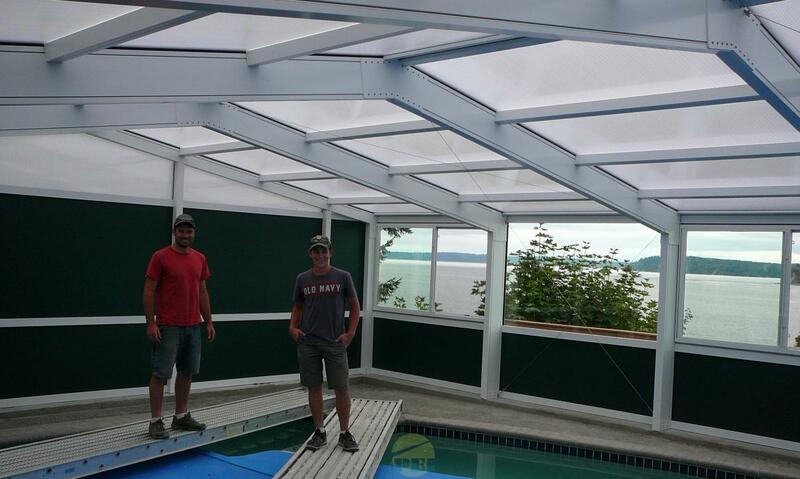 The concrete work and installation was completed by Daniel Martin Construction - Gig Harbor, WA. - 253-606-8282. 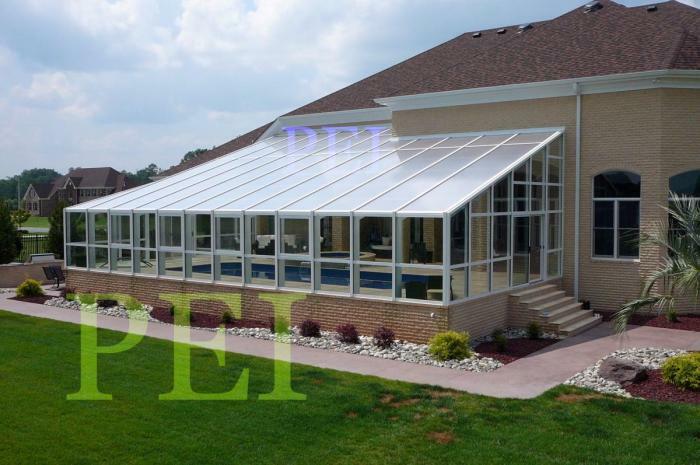 PEI supplied two working supervisors to assist in the installation. 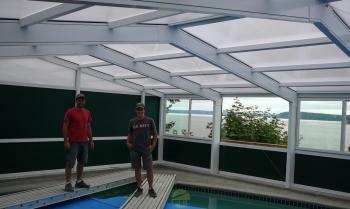 Great team work resulted in completing the pool enclosure erection in (1) week. 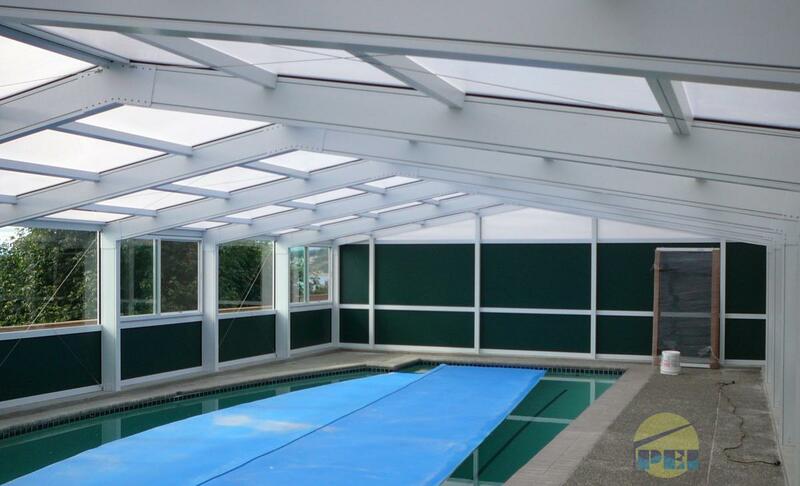 33' SPAN X 51' WIDE shed roof style swimming pool enclosure with white baked-on enamel painted structural aluminum frame. The glazing consists of 25mm (1") multiwall polycarbonate roof and 1" low-e high performance dual-pane insulated tempered glass walls. 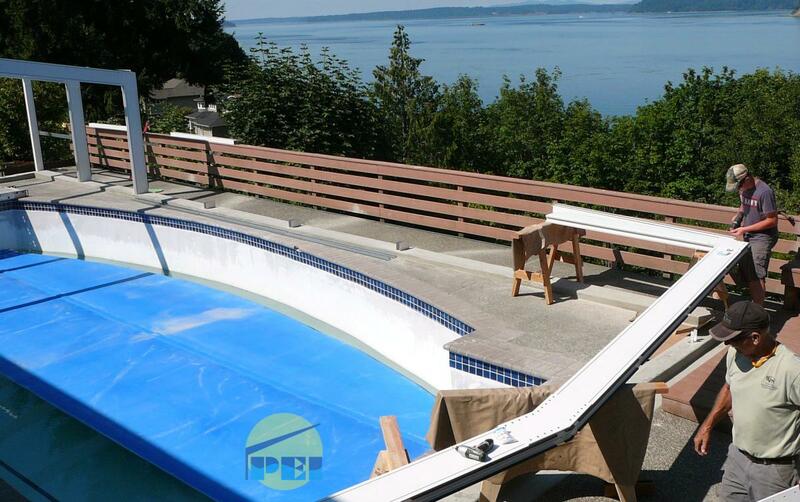 Enclosing a pool will give you an energy efficient in-door swimming pool environment. 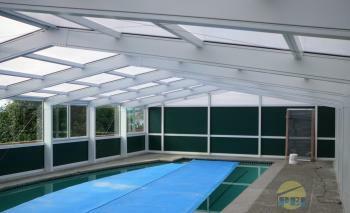 A natitorium will keep your pool cleaner plus reduce it's heating and chemical costs. 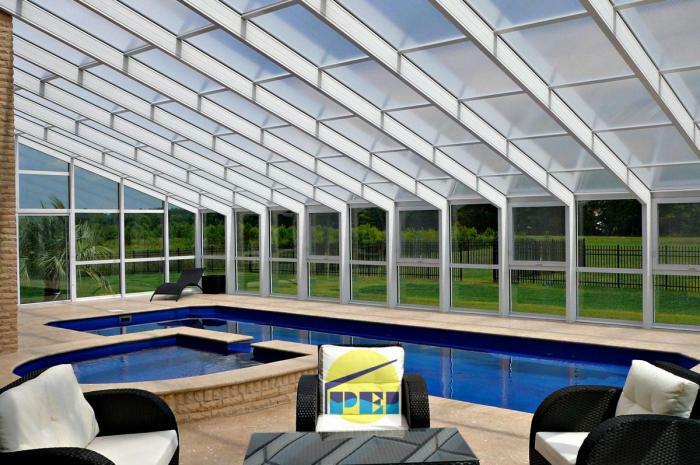 The polycarbonate roof material has an extruded-in U-V inhibitor that will protect a fiberglass or vinyl-liner swimming pool. 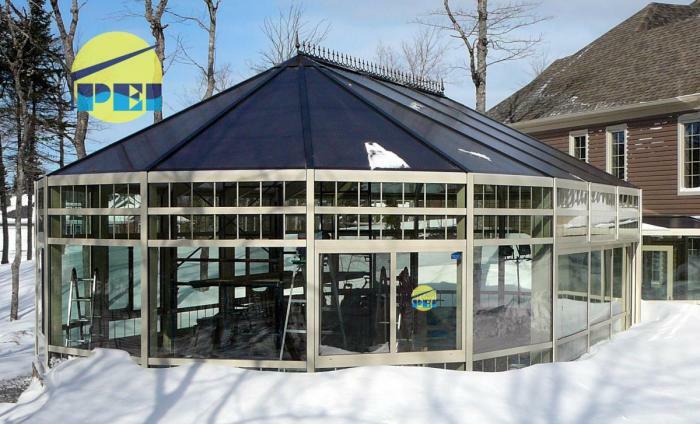 Our structures are designed and engineered per local snow and wind loads codes. Please contact us for more information. 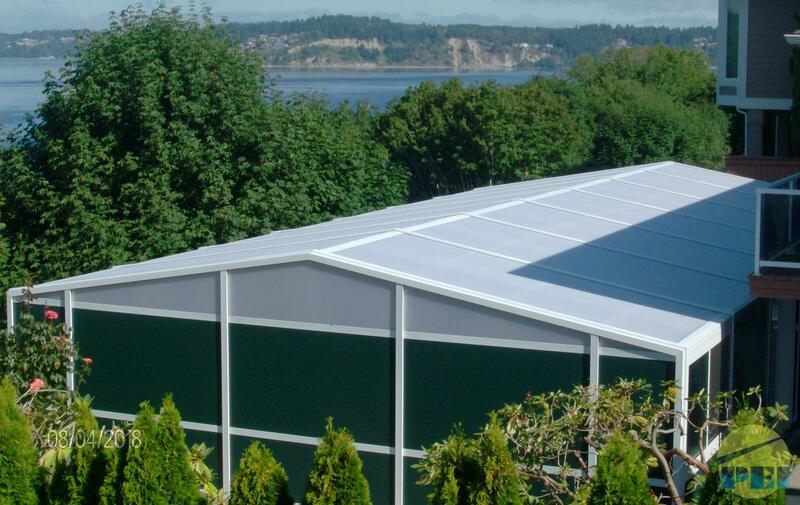 Below is a gable shaped enclosure with dark bronze baked enamel painted frame. 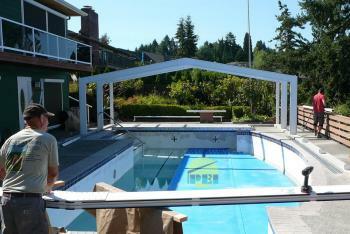 A segmented roof (conservatory style) pool enclosure with attached walkway to a glassed-in area under porch.